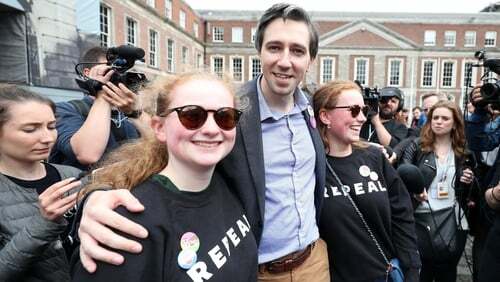 Minister for Health Simon Harris has confirmed that the legislation giving effect to Friday's referendum will be introduced in the Dáil before it breaks for its summer holidays. It follows consultations with officials in his department and also requests from the Opposition. Mr Harris wants the passage of the legislation, the introduction of new clinical guidelines and the new regulations for abortion pills to take place in parallel. The Government is still aiming for the legislation to be passed by the end of the year. Earlier, Mr Harris said that he will consult the Cabinet, Opposition and stakeholders this week. Fianna Fáil leader Micheál Martin has said he is in favour of holding a special Dáil sitting over the summer to get legislation passed to repeal the Eighth Amendment. Mr Martin said he would like to see the legislation published before the summer recess and that a second debate would also have taken place by then. Speaking on RTÉ's Today with Sean O'Rourke, he said that a legislative voice must be given to the will of the people. Mr Martin said he did not believe there were "fences to be mended" in his party. A majority of the Fianna Fáil parliamentary party was opposed to passing the referendum, where Mr Martin advocated a Yes vote. Mr Martin said there a freedom of conscience vote on the matter because people had deeply held views on the matter. He pointed out that there were 21 undeclared Fine Gael TDs, but there has been less media fixation on them. Meanwhile, the Bishop of Elphin has said he is surprised that the majority of people voted to repeal the Eighth Amendment, knowing the outcome would lead to the introduction of abortion. Bishop Kevin Doran said he was personally very sad about the outcome. Also speaking on Today with Sean O'Rourke, he said that anyone who voted Yes had committed a sin and should consider coming to confession. In late March, draft legislation, which provided for abortions up to 12 weeks was published, to show voters how the coalition intended to proceed if the Eighth Amendment was repealed. Many groups who campaigned for a Yes vote want this process accelerated. Medical bodies will prepare and publish clinical guidelines and new regulations for abortion pills will have to be introduced. There will also be a consultation process with GPs. The Offaly TD was given a three-month suspension when she voted in the Dáil against the holding of the referendum on the Eighth Amendment. Her party supported repealing the amendment. Ms Nolan also confirmed that she will oppose the introduction of legislation to give effect to the referendum result. The Chief Executive of the Irish Family Planning Association has called on the Government to also repeal the Abortion Information Act. Niall Behan said that it was only introduced in 1995 to deal with the Eighth Amendment, and now that the amendment was gone, it no longer needed to be on the statute books. Speaking on RTÉ’s Six One News, Mr Behan said that this act prevented referrals for women seeking abortions to the UK, and was standing in the way of good healthcare. He said it can now be repealled immediately, claiming it is causing confusion for doctors. Mr Behan said that in reality the actual abortion procedure was carried out in the UK, but there were already programmes in place here, such as counselling services, to help women who have abortions. He said that what was needed was clear legislation and guidelines and good leadership from the Department of Health. Mr Behan called for the introduction of a new national helpline for women with a crisis pregnancy that will give them a list of options that is centred on women's needs and offering affordable services.